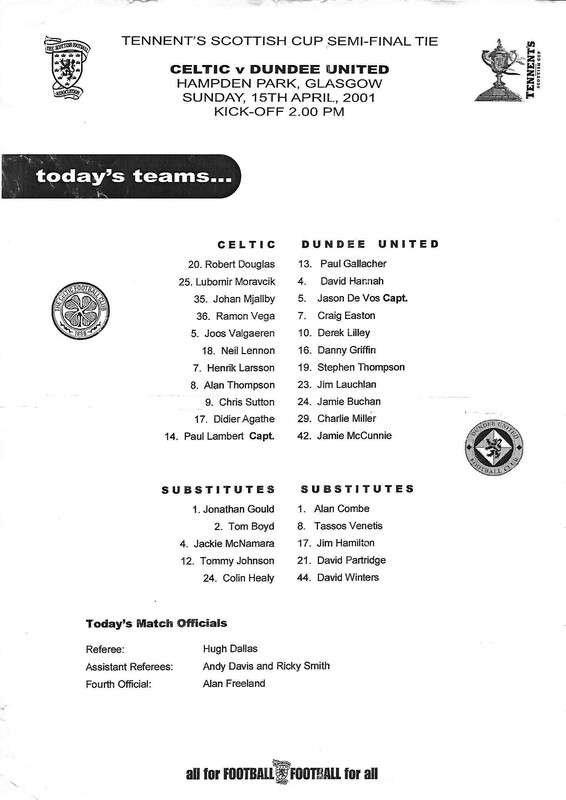 Following the 1-1 draw with Hearts the previous week boss Alex Smith stuck with the same starting eleven as they aimed for an 8th appearance in the Scottish Cup Final. Steven Thompson and Derek Lilley were paired in attack while it was a notable occasion for Jamie McCunnie who was celebrating his 18th birthday. After withstanding a period of early pressure United’s fans, clearly intent on spurring on their side, were off of their seats in 10 minutes when Charlie Miller surged forward to strike from 25 yards, but unfortunately his effort flew over the bar. 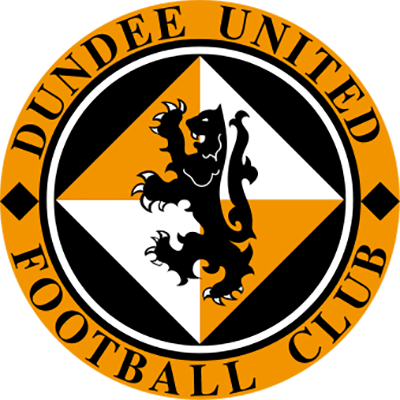 In 15 minutes United seemed to have strong claims for a penalty kick when Derek Lilley was downed in the box, but the referee saw it differently and awarded Celtic a free kick. In 16 minutes, after the first period of sustained pressure from Celtic, Joos Valgaeren blasted over then a minute later Paul Lambert was given a warning from the referee after chopping down Miller in the middle of the park. In 22 minutes Jason de Vos was the toast of his team mates after a timely challenge blocked a Chris Sutton effort at the edge of the box. United escaped in 26 minutes when a powerful Sutton header crashed back off the crossbar and out to safety. United were weathering the storm with some resolute defending, but needed to show more in attack if there was any hope of winning the match. Disaster then struck for the Terrors when in 30 minutes Henrik Larsson headed home from close range to give Celtic the lead. United’s response was immediate and they forced a couple of corners, but the Glasgow side managed to clear both. Miller did well in 37 minutes when he fed McCunnie the ball on the right. The youngster steadied himself before delivering a dangerous cross to the back post but Robert Douglas won the aerial battle and held. 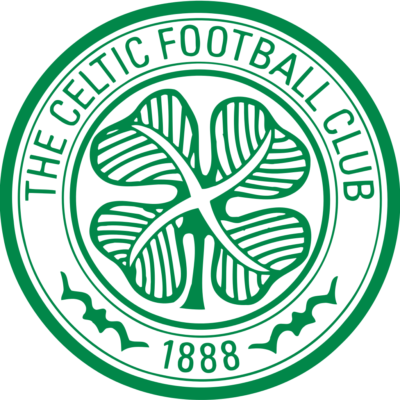 Lilley was then shoved in the back to win a free-kick in 43 minutes, from which a poor Danny Griffin’s delivery was headed clear by Neil Lennon. The early stages of the second half saw United enjoy their best spell of the match, with a lot more purpose shown going forward. A couple of corners and some neat play in and around the box gave the Tangerine Army some excitement before Lilley was the first player to be booked, when in 51 minutes he was judged to have unfairly challenged Lambert. Once again United were on the attack with Thompson running down the right, but his cross was carried out by the wind. In 56 minutes, Larsson tried his luck from 18 yards with a curling left-footed effort which Paul Gallacher was relieved to see go wide. In 62 minutes, United fans were on their feet once more when great play by Griffin and Miller freed Jamie Buchan on the left. His cross beat the keeper but was also just too deep for Lilley at the back post. 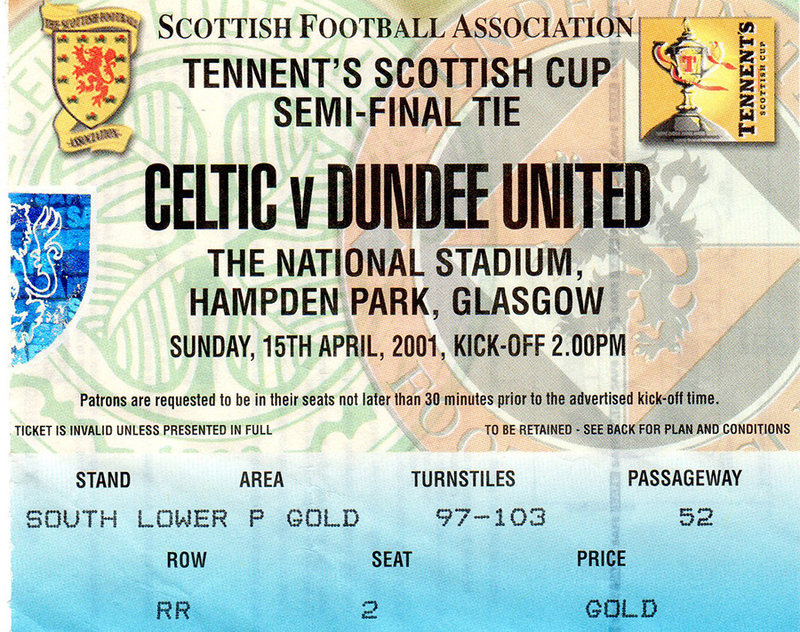 United were well on top at this stage, reminding Celtic that the tie was far from over. Celtic swapped Lubo Moravcik for Jackie McNamara in 67 minutes. In 72 minutes United made a change as they looked to grab a leveller. Craig Easton made way for a more attacking formation, with Jim Hamilton coming on to give United three in up top. Hamilton almost scored straight away when his toe-poke from close range was deflected wide for a corner. For all the hard work that United had put in, it just seemed that it wasn't to be the Tangerines day when Griffin tripped Henrik Larsson in the box to give Celtic a penalty in 77 minutes. The Swede converted to make it 2-0. The roof then caved in on United, as Jackie McNamara shot past Gallacher to make it 3-0 just a minute later. At last there was something for the fans to cheer in 86 minutes when Derek Lilley got on the end of Buchan’s pass to nip the ball away from the toes of Douglas and place the ball into an empty net. United immediately made another substitution, bringing on David Partridge for McCunnie. The final whistle signalled the end of United’s Cup run, despite a brave second half performance. While the cup dream was over for another year the backing from the United fans at Hampden was outstanding and the players efforts were appreciated by them at full time despite the obvious disappointment.